Written on December 7, 2018 . Posted in Blog. With the winter holiday season quickly approaching and our first snow already having fallen (a little prematurely we would say), now is the perfect time to service your heating equipment for the plunging temperatures ahead. Nothing is worse than waking up on a cold, wintry morning to find that your heater’s given out. As a rule, a poorly maintained system will result in higher utility costs as well as more expensive repairs. With a little preventative TLC, your house will be warm, efficient, and ready for the cold weather. This is one of the easiest maintenance tasks and yet one of the most forgotten. Dirty filters can prevent the flow of air and as a result, your system is using more energy to deliver less heated air to your home. Really not a great deal money-wise, huh? The harder your system works, the higher your heating bill and the more likely it will break down prematurely, which means spending even more money on expensive repairs. Let’s avoid that hassle and change the filters as frequently as necessary. Here’s an entire article we wrote on how to choose an effective filter for your system based on its MERV rating. You didn’t think that your home’s heating system was little more than a furnace, right? It’s a whole system of parts including vents, ducts, wiring, and registers, all of which work far more effectively if your home is sufficiently insulated. Check the insulation, namely in your attic and crawl spaces. Look for bare areas in your attic or where the insulation has been compressed. Check for water damage on the ceiling and attic walls, because water infiltration will make your insulation ineffective. If you unsure what you should look for, call us to schedule an inspection. Not only do we provide a complete service with a report for your heating system, but we will also visually inspect your attic. During our inspection, if we see any other areas that might be problems, we will also let you know you might want to contact your pest company. Don’t worry, we got you! If you don’t already have one, we strongly recommend investing in a smart or programmable thermostat. If you already have one, take this time to check the batteries in your thermostat and reprogram it to suit your winter needs. We recommend setting your thermostat to a cooler temperature at night and while you’re out of the house then raising the temperature back when you’re home. Here’s a whole article on how to save money on your heating bill this winter. 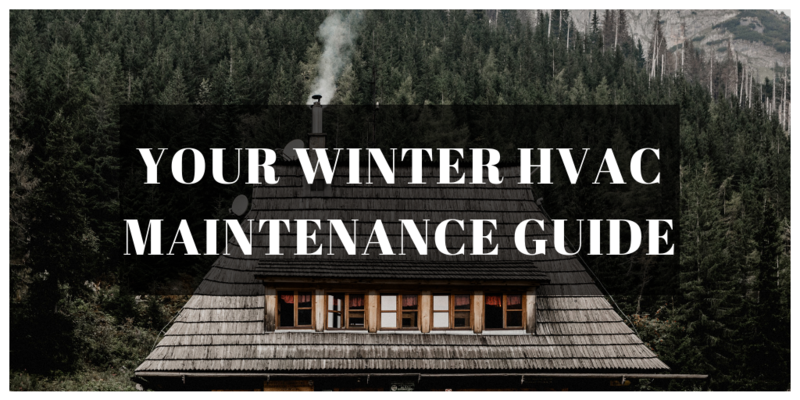 While fireplaces are a great source of heat and can allow you to turn down your heating system and, in turn, save you money, they need proper maintenance just like every aspect of your HVAC system. We would recommend having a chimney sweep (no, those don’t just exist in Mary Poppins) come out at least once a year. Professionals remove the tar, soot, and debris that could pose as a potential fire hazard and make sure there’s no structural damage to your chimney. Have an HVAC Professional Tune-Up Today! HVAC systems are complicated, but not for us! If you schedule a service visit with us, we’ll make sure your system is prepared for the cold winter ahead and make recommendations for how to make your system operate more efficiently before we even make those changes. Changes that could save you hundreds of dollars in the long run.